Holiday season is almost over, but winter flavors have not yet left! Here's a creative way to use eggnog before they're taken off the shelves! It's been a long time since I've put up a macaron post, so I wanted to share a recipe that I made over the holidays. 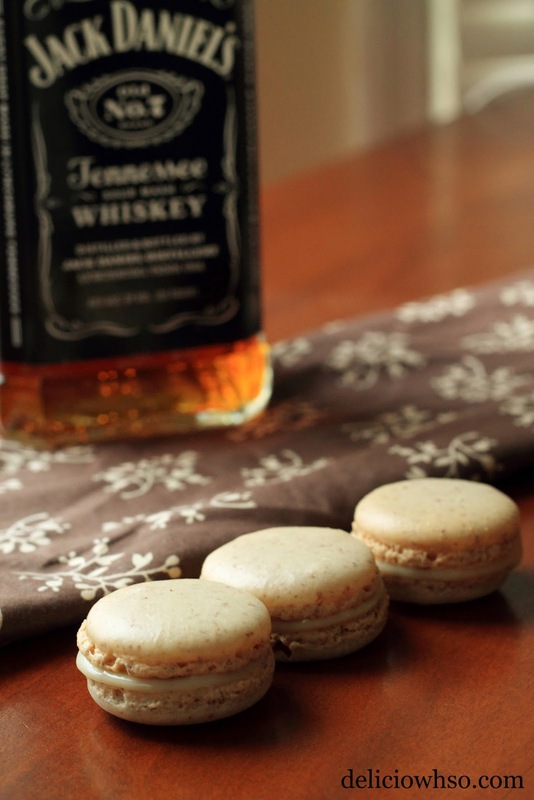 These macarons are complex with the spiciness of the cinnamon and nutmeg, the creaminess of the eggnog, and the sharp, subtle whiskey flavor. 1. Pulse almond flour, spices, and powdered sugar in a food processor until very finely ground. Be careful not to grind too long, because it will release all of the oils, ruining your final product. 2. Heat the eggnog until it boils. 3. Pour the hot eggnog over the chocolate. Gently stir until combined. 4. Add the whiskey to the ganache and mix to incorporate. Sprinkle the spices lightly on the top. 5. Cover the ganache with a piece of plastic wrap. Allow the wrap to touch the surface of the ganache so a film does not develop on the surface of the ganache. 6. Allow to cool to room temperature before using. If it is soft, allow to harden further in the fridge. Though macarons are not easy to make, they are well worth the time and effort. They are delicate and sensitive, but the end product reveals the hard work and love put into it.